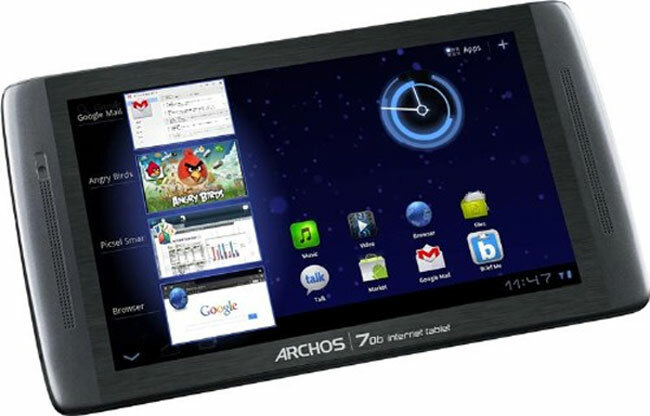 The Archos 70b tablet was spied getting some of the approvals it needs not too long ago. Today the tablet has gone official with the tablet getting the full unveil. It runs Android 3.2 Honeycomb for the operating system. The tablet is a 7-inch screen and replaces the old Archos 70. The best feature of the 70b tablet is the price with MSRP at $199 making it the same price as the Kindle Fire. The tablet has full Android Market access, which the Fire lacks. Archos crams 512MB of RAM inside and the tablet has 8GB of storage. The screen resolution is 1024 x 600 and the tablet has WiFi and a microSD card slot for storage expansion. A HDMI output allows the user to shoot content out to their big screen. The tablet will be in stores in January.